In the 1830s, railroads came to Michigan. The earliest successful ones were those built across the state in an east-west direction, but close to the Indiana border. In that era, passengers traveling to the Midwest from the east coast crossed New York State on the Erie Canal—completed in 1825—then sailed across Lake Erie to Toledo or Detroit where they boarded a train to travel further west. Freight from the Midwest moved east in a similar manner. By 1853, two Michigan railroads reached Chicago, one from Toledo and the other from Detroit. Rail lines into the northern Lower Peninsula awaited further developments. After 1850, many of Michigan’s numerous swamps were drained, reducing malaria and making more of the sparsely populated state inhabitable. Then the Civil War demanded many types of industrial products that required wood from the limitless white pine forests of Michigan. Nineteenth-century population growth in Michigan is attributable to Civil War’s demand for industrial goods. Indiana railroad developers proposed a line that would run north from Fort Wayne to Kalamazoo, then to Grand Rapids and on to Cadillac, and then up to the Straits of Mackinac. The Grand Rapids and Indian Railroad (G. R. & I.) secured a charter from the state government in 1857 that provided land grants to build this line. Unfortunately, the organizers could not obtain financing. Twelve years later, the state government demanded that they either start construction or lose their rights and grants. Shortly thereafter, they obtained financial support from a major contracting firm associated with the Pennsylvania Railroad and constructed a few miles of line north from Grand Rapids. The state’s pressure and the growing lumber industry in Michigan were sufficient to start the project. By 1870, the line from Fort Wayne to Grand Rapids was operating. Rails north from Grand Rapids reached Cadillac in 1871, Petoskey in 1874 and the Straits of Mackinac in 1882. Three years later, the railroad started to ferry rail cars across those straits, a practice that linked Michigan's two peninsulas and continued for a century. In 1872, the G. R. & I reached Grand Traverse Bay from a branch that left their mainline north of Cadillac. In 1886, they purchased a line taking their rail from Grand Rapids to Muskegon. Toward the other end of the railroad, the G. R. & I. built south to Richmond, Indiana where they connected with a Pennsylvania Railroad line to serve Cincinnati. The G. R. & I. was not a financial success, perhaps because of competition from the Michigan Central and the Pere Marquette railroads. Indeed, the Michigan Central reached the Straits of Mackinac with rails from Detroit one year before the G. R. & I got there. In 1895, the G. R. & I. defaulted and was taken over by the Pennsylvania Railroad, although the G. R. & I. retained its separate corporate identity until the end of the Depression. By the first decade of the 20th century, the lumber boom in Michigan was ending and so the Pennsylvania introduced new strategies to boost business. They purchased ferries and began carrying freight cars across Lake Michigan from G. R. & I. ports in Muskegon and Northport. This was not a success. Then the Pennsylvania Railroad promoted tourism in northern Michigan and began running summer trains to resorts at the tip of the Lower Peninsula with numerous Pullman cars from Cincinnati, St. Louis and Chicago. 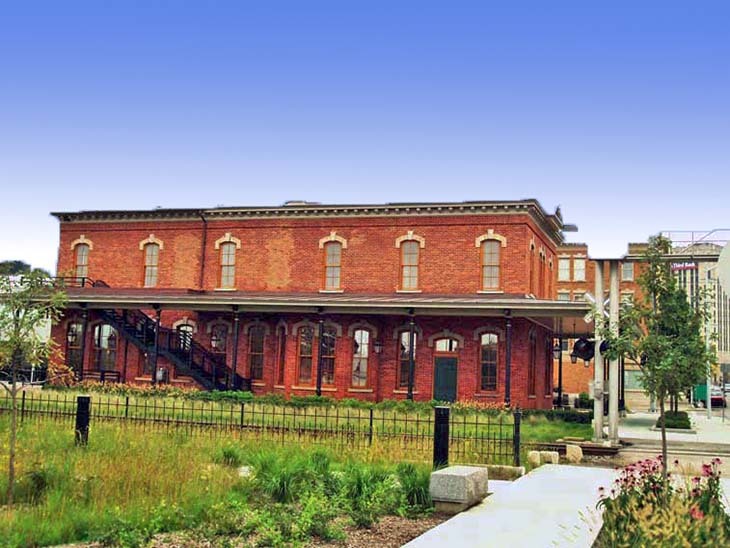 The beautiful Italianate station that you see was the second G. R. & I depot in Kalamazoo. The first one—a wooden structure—burned, so in 1874, a new one was built utilizing brick. Indeed, if you look closely at this station, you see how accomplished brick masons were in the decade following the Civil War. You might pay special attention to the appealing brick work on the chimneys above the roof line. This station was never as busy as the nearby beautiful but massive Michigan Central Station, designed by Cyrus Eidlitz and constructed in 1887. Indeed, in 2006, the Michigan Central Station hosted eight Amtrak trains every day and was Michigan’s second busiest rail terminal. 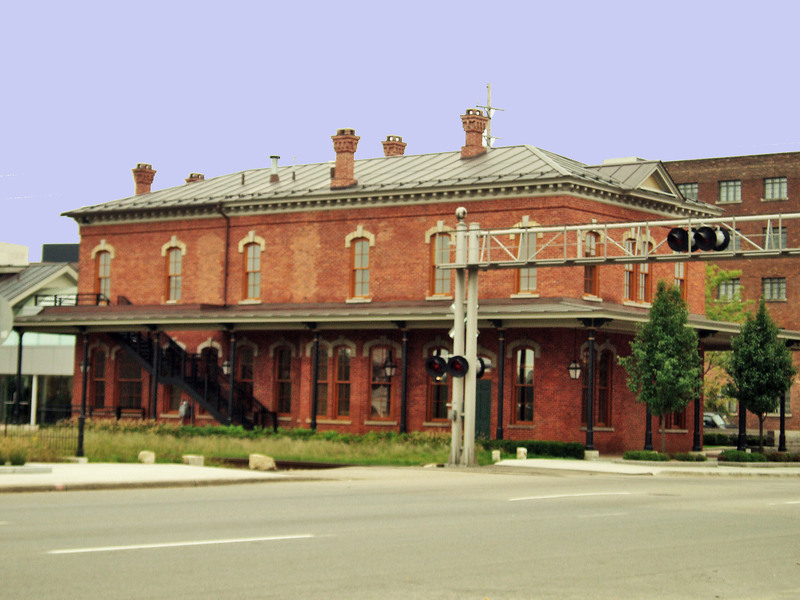 In 1910, the G. R. & I. station in Kalamazoo was served by a pair of trains making a leisurely 19-hour journey from the Straits of Mackinac to Cincinnati, another pair of day trains traveling daily from Traverse City to Cincinnati, and a final pair that daily made the Grand Rapids to Fort Wayne trip. Passenger train service was greatly curtailed in the Depression, but ridership boomed during World War II. In 1946, the station was served by a pair of trains that made the long Cincinnati to Mackinaw City trip and offered Pullman car service and a pair of day trains traveling from Grand Rapids to Fort Wayne. Regular scheduled passenger service at this station ended in 1954, but the Pennsylvania continued running special trains to northern Michigan resorts several times a week from Memorial Day to Labor Day. If the 1870s were the years of the railroad boom in Michigan, the 1970s were the years of the railroad bust. Several major lines survived, but most north-south lines and many branch lines throughout the state were scheduled for abandonment. After the merged Pennsylvania-New York Central Railroad went bankrupt, the G. R. & I. line from Fort Wayne to Grand Rapids was included in the new Conrail Railroad, but the rest were not. Some freight trains continue to pass by the Kalamazoo G. R. & I. station as they travel from Grand Rapids to Fort Wayne. The State of Michigan stepped in and attempted to preserve freight service to many locations in hopes of preserving the state’s economic base. For some years, a short line railroad operated the G. R. & I north from Grand Rapids to Mackinac City but they eventually failed. The state then removed the G. R. & I. rail line from the 97-mile Grand Rapids to Cadillac stretch and converted it into a bicycle pedestrian path now known as the Fred Meijer White Pine Trail State Park. The Arcus Foundation is a family foundation established in Kalamazoo in 2000 with the aim of improving the quality of life in southwest Michigan. It is also one of few foundations that emphasizes programs and organizations that welcome members of the Gay, Lesbian, Bisexual and Transgender community. The G. R. & I. station had been a restaurant for more than 20 years, but then was idle. The Arcus Foundation restored the passenger station to its original glory and then rebuilt a building just to the South where the freight station had been located. These facilities house the Arcus Foundation and several other Kalamazoo non-profits. State of Michigan Registry of Historic Sites: P23641, Listed: March 2, 1976. Use in 2006: This station is operated and maintained by the Arco and provides meeting space for local non-profit organizations.